The FPF Privacy Book Club provides members with the opportunity to read a wide range of books — privacy, data, ethics, academic works, and other important data relevant issues — and have an open discussion of the selected literature. 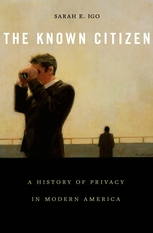 We are excited to share The Known Citizen: A History of Privacy in Modern America by Professor Sarah E. Igo was chosen as the popular favorite by our readers. We are thrilled Professor Igo will be joining us for the December book club to introduce her book and answer questions. Please join us on Wednesday, December 5, at 2:00 pm (EST) for the next FPF Privacy Book Club. If you are an existing member of the Book Club, you will receive the virtual conference dial-in information near the discussion date. You can join the Book Club here. Please feel free to forward this sign up link to friends who also may be interested.